So, this is it – we’re out of the Black Friday and Cyber Monday sales rush and now firmly into the frantic build-up for the holiday season. The sales bonanza weekend and Thanksgiving-shortened week represented the strongest for equities, yet it was in fact energy stocks that underpinned microscopic gains during the lead up to the holiday. 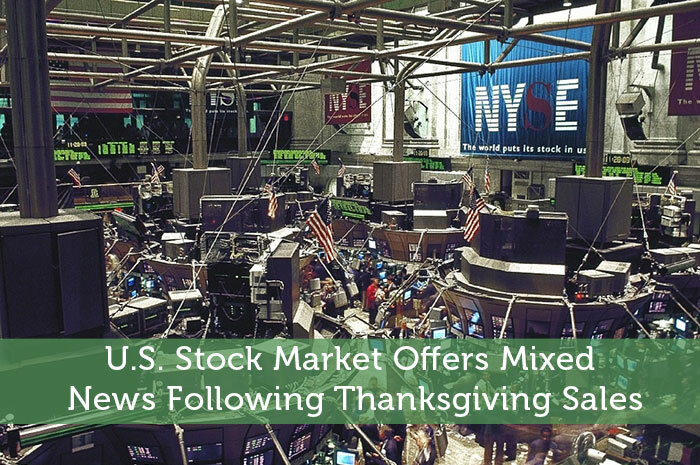 The week prior to Thanksgiving enjoyed a 3.3% surge in the S&P 500 index followed swiftly by the smallest stock movement since July. Certainly, with increased political unrest, mixed economic results and less that positive headlines flooding our newscasts, equities aren’t exactly swaying. With a jobs report imminent and the Federal Reserve meeting due to take place on December 16th, investors have clearly been focusing on the future of U.S. monetary policy. Despite this, equities are actually in a much improved state. At the start of October, the S&P was down 8.6% from an impressive high in August and with just three weeks until the Fed starts its discussions, the benchmark gauge shows that shares are climbing back to where they were before the correction started. So, little to get excited about, but if you’re looking for positive stock market news, you need look no further than consumer, health and the auto industry. Due to strong performances by all three, stocks opened positively on Tuesday following the long weekend. The S&P healthcare index, for example, grew 1.7% while the consumer index retracted Monday’s losses by bouncing back 1%. Small gains, but positive nonetheless. After the chief executive of UnitedHealth Group (UNH) defended his company’s potential withdrawal from the Obamacare health insurance exchanges, their shares rose to $116.26, an increase of 3.1 percent. Similarly, shares of Anthem (ANTM) enjoyed a 4.2 percent rise to $135.82 per share. Thirsty for more good news? It seems people are still investing in new cars, with strong November auto sales demonstrated by Ford and General Motors’ respective increases to $14.56 and $36.26 per share. And yes, while growth of 1.6% and 0.2% isn’t seismic, it is a clear indication that the automotive industry can pull punches with the best of the stocks during difficult times. This month’s Federal Reserve meeting could result in a rise of interest rates for the first time of nearly a decade and with so much uncertainty leading up to the talks, it is no wonder that areas such as construction – which enjoyed a non-too-shabby increase in spending in that sector during the month of October – subsequently contracted in November for the first time three years. While investors wait intently for the Fed meeting and European Central Bank gathering this Thursday (where the trillion euro bond-buying program is expected to be ramped up), everyone else is pinning their hopes on some rather more positive news during Friday’s employment report where it is expected we’ll be informed that 200,000 jobs were added to the economy in November. A mixed bag following Thanksgiving, then, but we should know an awful lot more about the future of our economy within the next two weeks. Big news headlines feel imminent. There’s a lot of catching up to do it seems for the US market. 4th quarter estimated GDP growth seems to remain close to 2 per cent. In fact, the consumer spending increased just 0.1 per cent since September. However, 4th quarter is likely to get extra support from business spending.